A third career Olympic Games gold medal secured; following success in the Women’s Team event at the Rio 2016 Olympic Games on the evening of Wednesday 16th August, China’s Li Xiaoxia announced her retirement from international play. In recent times there has been considerable speculation that the Rio 2016 Olympic Games would be her swansong; at the Qoros 2015 World Championships in Suzhou, she stated that her time as a member of the Chinese National Team was coming to a close. Notably at the press conference which followed the Women’s Team success in Rio de Janeiro, the speculation increased; later in the evening on her Weibo account, which is a hybrid of Facebook and Twitter, the 28 year old announced her retirement but did not totally close the door. Loyal to the call of the country, she indicated that, should she be required for the national team then she would respond. However, with the embarrassment of riches in the Chinese camp; that is most unlikely. Ding Ning and Liu Shiwen have undoubtedly one more Olympic Games left in the locker, Ding Ning at 26 years of age being one year older than Liu Shiwen. Now waiting in the wings to fill the shoes of Li Xiaoxia is Zhu Yuling, followed by Chen Meng and if Kong Linghui, the Women’s Team National Coach, is concerned then he can always send for the bodyguard. He can select Wu Yang, the player who loses to members of her own team but not to those from foreign shores. It was at the inaugural World Junior Championships staged in 2003, in the Chilean capital city of Santiago, that we first set eyes on Li Xiaoxia. She completed the tournament with gold in three events, the one to prove elusive being the Girls’ Singles crown. In the final of the Girls’ Team event, she was the pivotal player, she beat both Sayaka Hirano and Ai Fukuhara to guide her colleagues, Peng Luyang and Li Qian to a three-one success. Later she won the Mixed Doubles event with Zeng Cem, who subsequently moved to Turkey; also she clinched the Girls’ Doubles title in partnership with Li Qian. Gold but not in the Girls’ Singles competition; she was beaten at the semi-final stage by Li Qian, the champion elect. Notably Li Qian never progressed to greater heights; she was a left handed shake-hands grip attacking player, not the Li Qian who is the right handed defender who now plays for Poland. Also there is one more Li Qian, the 2014 Women’s Singles Class 3 World Para champion. A quartet of promising players but it was to be Li Xiaoxia, who learned her skills in Anshan, Liaoning Province, a hotbed of table tennis, who was to make the most progress. In 2006 she made her World Championships debut in Bremen; the same year she reached the title deciding contest in the Women’s Singles event at the ITTF World Tour Grand Finals. One year later she was the runner up at the Liehberr 2007 World Championships, a fate she was also to suffer four years hence at the GAC Group 2011 World Championships in Rotterdam. Additionally in 2011 she was the silver medallist in the Women’s World Cup. The results earned her the tag of “Miss Number Two” from her supporters; it was hardly deserved. In 2007 she had won the Women’s Singles title at the Grand Finals and one year later had secured the top prize at the 2008 Women’s World Cup. Also in 2010 she had won the Women’s Singles title at the 2010 Asian Games. Successes and in 2012 and 2013 the pinnacle, Olympic champion in the former year, World champion in the latter; “Miss Number Two” was now “Miss Number One”. Results only the precious few achieve and there is much more to merit the number one tag. 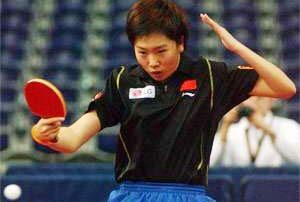 She was a member of the successful Chinese outfit at five World Championships; she won eleven ITTF World Tour Women’s Singles titles, whilst forming a most successful Women’s Doubles partnership with Guo Yue. They won the Women’s Doubles title at three consecutive World Championships starting in 2009 in Yokohama. Additionally they completed eleven such achievements on the ITTF World Tour and twice won at the Grand Finals. They succeeded in 2007 in Beijing and in 2011 in London. Impressively she achieved the goal. She more than achieved the goal; she won all the major titles on offer; that affords her legendary status. Furthermore she bid farewell standing on the top step of the podium, standing on the highest step of all, the very pinnacle, the citation doing justice to her outstanding career, the supreme accolade: Li Xiaoxia, gold medallist and Olympic champion.